Last night, for some reason I had a handful of contractions pretty close together. I am SURE they were Braxton Hicks contractions… at least I hope so. There was no pain in my back. It was all in the front – which I think is also a good sign. But it got to the point where I could almost predict when the next one would arrive. So, I wanted to track them. I thought I was having too many for it to be casual and ended up finding a Contraction Monitoring App that was free. I downloaded it and began to drink about a gallon of water at full speed. 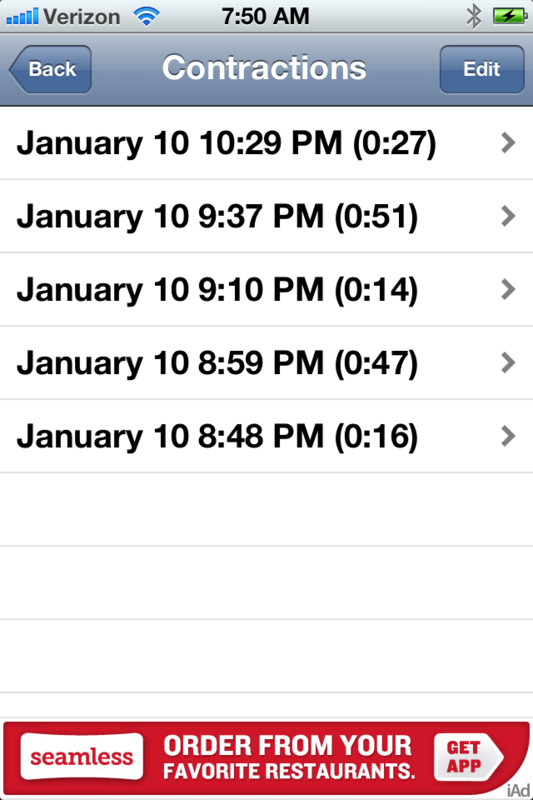 After downloading CTXTimer Light, I began to track the remainder of my contractions from last night. One feature which I absolutely love about this contraction monitoring app is the fact that you can monitor how LONG your contraction was. There is a start / stop timer – and it all happens with the click of a button. The app also tracks your history which means you could just pass the phone over to your doctor during your next visit. Another added bonus. After I finished a pitcher of water, my contractions began to spread out more – THANK GOD. Eventually they completely stopped. I must have been dehydrated. All in all – I think I had about 15 or so which made both Bill and me very nervous. Thankfully, I’m 32 weeks today. If you are pregnant and want an app that can help you track your contractions, check out CTX Timer Light. You will have to do a search on your phone because I can’t find a website for the app online. I have a question. I am the mom, and my daughter is expecting our first grandchild. The baby has everything she could possibly need. I want to get something to take to the hospital to give my daughter after she gives birth to let her know how proud we are of her as a new mom. Since you can relate, any ideas of what would mean something to you to receive? Please give me ideas and maybe if any subscribers received something special they could comment as well. I think it depends on what she likes. A spa gift certificate? A Starbucks Coffee? Her favorite dessert? Make it very personalized. She will love it!